The Monasteries of Daphni, Hossios Luckas and Nea Moni of Chios are masterpieces of the 'second golden age of Byzantine art'. The three monasteries date from the 11th and 12th century. They have the same typology and aesthetic features, with marble and mosaic decorations. They are geographically distant from each other: the monastery of Daphni is located in Attica, near Athens, the Hossios Luckas is located in Phocida near Delphi, and the Nea Moni of Chios is on the Aegean island of Chios. The Monastery of Daphni is part of the WHS Monasteries of Daphni, Osios Loukas and Nea Moni. All these 3 medieval Greek monasteries contain gold-coloured mosaics that are valued as masterpieces of Byzantine art. The monastery of Daphni, located just outside Athens, is an easy one to access and that’s the one I choose for my visit too. It took about 45 minutes to see it all & even combined with a return trip from and to Athens city center it costs less than 2 hours of your time. Together with a Russian couple that also wanted to visit Daphni, I left the city bus in a suburb of Athens. Many buses will stop near the monastery, see the official website for the range of bus lines. I used a one-day Ath.ena ticket to pay, it covers the metro rides as well. It was somewhat of a search for the entrance, but then we were faced with a heavily secured monument. Access is prevented by a large iron gate and a high fence that fully encircles the former monastery. Would it still be closed today (= Friday)? No: it turned out that you can ring a bell and then the gate will open automatically. They have been restoring this world heritage since 1999. It is almost finished, but not yet completely - hence the limited opening times (Tuesdays and Fridays) and free entrance. Workers are busy still on the excavations outside of the main church. We were kindly welcomed though to have a look everywhere and take pictures. It all looks a bit 'new'. From the outside, especially the windows of the church stand out. They are decorated like a kind of traffic light: 3 circles in a vertical row. The columns that carry the roof of the narthex are almost all replicas: Lord Elgin took the originals along with the frieze of the Parthenon to England, where they now catch dust in the cellars of the British Museum. One original Ionic column is still left: it was reused from the Apollo sanctuary that stood on this spot in Antiquity (and therefore qualifies as spolia I guess). On the inside the church is very bright, both because of the use of white limestone and the many windows. 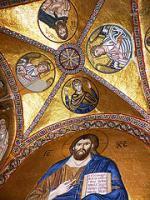 Many gold-coloured mosaics can be found on the ceiling and on the upper parts of the walls. Lower to the ground, the walls have wall paintings of a later date. The mosaics are the distinctive feature of this monastery church. They exclusively depict biblical scenes. The usual set of prophets, Mary with the child Jesus, the archangels, life and death of Christ and the life of Mary can be seen. There is an information panel in the church which explains which mosaic represents what scene. 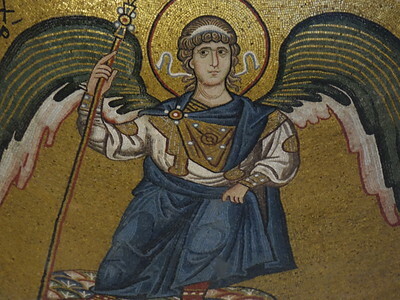 The mosaics have a bright-golden background; the colour is so bright because it also incorporates glass. The makers of the mosaics probably came from Constantinople. It is unknown who the sponsors were of this richly decorated building. Since 1821, the monastery no longer has a religious function and from 1888 on it was in fact already a historical monument. Nowadays, certainly after the renovation is over, the delicate church is a fine destination for a short detour from the Athens monuments. Of the three geographically dispersed monasteries inscribed together as this WH site, we could only fit one into our Greek itinerary in July of 2018, and our choice fell on Hosios Loukas, the largest and likely the oldest. Hosios Loukas’s fame derives from the lavish decorations of its main church, the Katholikon. 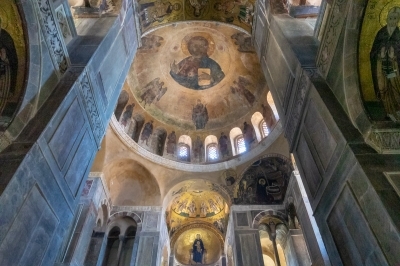 These mosaics, frescoes, and marble surfaces date from the 11th century, and are among the best examples of the grand church decoration during Middle Byzantine Renaissance. In addition to the main church, you can visit the crypt, peruse an archaeological collection, learn quite a lot about the history of the monastery itself, and step into a model monk’s cell. Around an hour is quite sufficient to take it all in, but the visit can be extended: there are hiking paths on the mountain around the monastery and a nice shaded terrace with outdoor cafe seating area and great valley views just outside the gate. Hosios Loukas is located a little bit over 2 hours drive northwest from Athens in the administrative region of Central Greece. Delphi is about further half an hour drive northwest, easy to combine on a day-trip from the capital. It should be noted that Monastery of Daphni, another of the three properties grouped in this site, is located right at the edge of Athens, accessible by public transport (less than 40 minutes from the center of the city). We drove by it, but could not fit a reasonably-timed stop into our schedule. 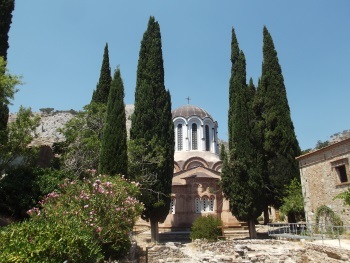 As indicated in previous reviews, for many years it has only been possible to make very limited visits to the Monastery of Daphni, situated in the Western suburbs of Athens, both in terms of when it has been open and in what could be seen when you got there. The building has had a very chequered life having been sacked by the Franks, been used as a barracks and an asylum and enduring numerous earthquakes. The latest of these in 1999 (9 years after inscription) led to a major restoration project which resulted in the monastery becoming a building site. Most photos on the Web show it completely encased in scaffolding. In recent years it has only been open for limited hours on Tuesdays and Fridays. WHS travellers should know, however, that the situation has improved and that it might be worth their while including a visit to it in any future visit to Athens. This limited opening was still the situation when we visited it in Oct 2017. However, I can report that all external scaffolding has now been removed and that, internally, there is only a small area still undergoing work in the Narthex which hardly detracts from what is on show - not much different from preservation work one will find in many WHS. Those who visit Athens from now on should be aware that a visit will provide excellent views of the restored mosaics – well worth the “free entry” which still applies! Indeed if you are in the area on a day when it is currently closed it might well be worth checking that it has not, by that time, been fully “opened”. The caretaker we spoke to indicated that it was hoped to do so relatively quickly - though what that means in reality in contemporary Greece I know not! It just “might” be during 2018? The site certainly appears to be being prepared for this with a small museum next to what could be a ticket office (don’t expect “free entry” when it has been properly opened!) and, in an adjacent building, a larger and very interesting exhibition about the entire restoration process with comprehensive and expensively prepared presentation boards and the possibility of an audio visual presentation. The interior of the church also has an explanatory board describing all the mosaics. I was a bit shocked at the vibrancy of the restored murals and concerned that the process had created something artificial. I was however assured by an expert who was present leading a small group of “Byzantium aficionados” that, what we were seeing, was how they would have been before earthquake damage and the accumulation of years of grime – it appears that the colouring used for the mosaics included ground glass to increase reflectivity. A full “range” of the mosaics is now visible covering “Heaven” in the dome with Christ, Mary, Prophets etc, down through scenes from the Life of Christ to images of Saints. We gave it a bit over an hour and were easily able to take it in and drive on to Bassae and back using a rental car from downtown Athens on a 1 day hire. The site is located high in the mountains in the centre of the island. Construction of the church started in the 11th centuary, although little of this remains. It was built in the Macedonian Renaissance style by Constantine IX upon his becoming emperor of Byzantium. The mosaic ceilings are a spectacular feature of the interior decoration. The church was dedicated to Theotokos, and at its peak held 800 monks. However as a result of earthquakes, the depredations of the Genoese and then the Ottomans, and finally being sacked and looted in the War of Independance in 1822, the population has dwindled to a handfil of nuns. I visited this WHS in June 2014. At first I had planned to only visit the Daphni Monastery due to its proximity to Athens' city centre. The monastery suffered from severe damage from an earthquake in 1999 and is currently being totally restored. It is accessible to visitors on Tuesdays and Fridays AM free of charge. The exterior is completely covered in scaffolding and there isn't much to see. What disappointed me most though was that a 6 lane highway is built just next to its perimeter and the noise from traffic is unavoidable. The interior is like a construction site and the only damaged mosaic worth mentioning is the one depicting Christ. The only plus side is that you get to visit up close on the scaffolding itself but that is not much of an advantage when viewing mosaics. Following my disappointing visit, I looked up Hosios Loukas. I found out that it is situated near Distomo, about 36km away from Delphi. Therefore I decided to go there before visiting Delphi and it turned out to be a very good choice indeed. The surroundings of Hosios Loukas are very pretty, overlooking a huge valley full of lined olive trees beneath Mt Helicon. The exterior itself is very well maintained and the whole monastery complex can be visited not only the church itself. However, the main highlight of my visit was definitely the church interior and crypt with splendid Byzantine mosaics and frescoes of Orthodox monks from the period of the Macedonian Renaissance. I was born in Chios and I have been in Nea Moni and Hosios Loukas and I'm very proud to be from chios, every time i go to Nea Moni i feel a new person. I have been once to the beautiful monastery of Hosios Luckas, a great masterpiece of the late Byzantine art, one of the three Greek monasteries forming this WHS. The hermit Saint Luke the Stiriote lived here, on the western slopes of the Helicon, isolated in a landscape of olive trees, from 946 until his death in 953, among the ruins of a temple of Demeter, and built here a church dedicated to Saint Barbara (946-955); in the 10th century an another church was built for the pilgrimages of great enduring success, visiting his tomb. Since the 14th the monastery belong to the Cistercians, that dedicated the monastery to the Virgin and maintained it as it was. It was damaged by various earthquakes and by the bombardments of the Second World War. It has a large pentagonal enclosure and extends on an east-west axis bearing traces of successive additions. The monastery has many minor buildings, like the bell tower or the monks’ cells, but the main complex is really stunning. To the north-east there is the church of Theotokos, built on that of Saint Barbara. It is very different in style from the church of Katholikon, because it was reconstructed by the Cistercians, that dedicated it to the Virgin, linked it by a porch with cross vaults to the cells, built a slender octagonal drum and decorated the interior very simply, also with the floor made of nice marble slabs. The crypt of the second primitive church, that contains the tomb of Saint Luke and is decorated with nice 11th century frescoes, is now the crypt of the successive main church of Saint Luke, built in the 11th century. This is built onto the southern wall of the narthex of the Theotokos and has a passage to its esonarthex, forming with it a beautiful block of linked buildings, completed by the heavily restored (mainly in 1943) refectory, a parallel building on the southern side. The huge central volume of the dome rests on a drum pierced with sixteen windows and is supported on three sides by bays with groin vaults and inside (where is also a women’s gallery) by penditives. The church, made of stone and terracotta, has windows under pointed arches; the bema and the apse define the cross-in-square plan of the church (inspired to Saint Sophia of Istanbul). 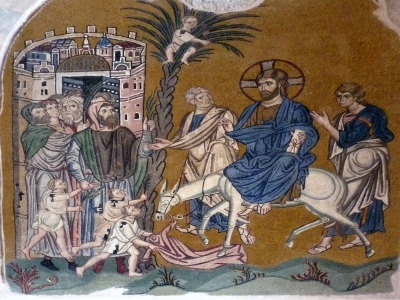 Its complex plan is unified into a harmonious and luxurious whole by the rich decoration of great extent and coherence of mosaics (over the portal of the church of the narthex, on the three apses, on the central vault, on the penditeves of the main dome, on the secondary dome, on the right side of the presbytery), frescos (on the main dome) and marble slabs and medallions of the pavement. I liked very much the monastery because of its architecture and its mosaics. It’s absolutely worth of visit and justifies the inscription on the WHL. It’s state of conservation is very high (apart from some ruined buildings) but its authenticity have been damaged by the war destructions of buildings (refectory, bell tower…) that have been reconstructed in some cases very well, in others in a bad modern way (cells) and in others left in state of ruin. You must pay for visiting the monastery but not all the buildings are accessible inside, only the main ones. It’s quite hard to reach it. From the highway n° 1 going from Athens to Thessalonika you have to exit at Thebes and take the road n° 3 going to Lamía and at Livadía the road n° 48 going to Delphi and the road n° 29 and at Dhistomon turn on a minor road leading to the monastery. We have also been trying for three years to visit the monastery of Daphni but it was always closed, two times for restoration works and one for an earthquake happened not much time before, so they have been very frustrating experiences. We have only seen a view of the monastery with its beautiful church (the only standing building together with the enclosure) after climbing all around the surrounding small mounds; however I can’t count it as a visited site, but I can consider visited the WHS of the monasteries because of the trip to Hosios Luckas. It is very easy to reach the monastery because it is about 100 meters from the highway A8 going from Athens to Patras. I can also say that this highway affects the integrity of the site and its surrounding landscape. 2.5: Solivagant Gary Arndt Martina Ruckova Svein Heltberg Tony H.
From "Monasteries of Daphni, Hossios Luckas and Nea Moni of Chios" to "Monasteries of Daphni, Hosios Loukas and Nea Moni of Chios"
Destroyed or damaged by Earthquake: Daphni Monastery: It suffered severe damage by earthquakes in 1889 and 1897, and was heavily damaged by the 1999 Athens earthquake. Still being restored.